Large size, 18K pink gold case, rhodium plated dial, manual winding mechanical movement, alligator strap with 18K gold deployant buckle. Water resistant to 30 meters (100 feet). Large size, 18K white gold case, silver dial, manual winding mechanical movement, alligator strap with 18K gold deployant buckle. Water resistant to 30 meters (100 feet). Large size, 18K yellow gold case, silver dial, manual winding mechanical movement, alligator strap with 18K gold deployant buckle. Water resistant to 30 meters (100 feet). Large size (47.4mm x 38.7mm) 18K white gold case, sapphire back, octagonal crown set with a faceted sapphire, sapphire crystal, nickel silver dial with hours and minutes indicated by skeletonized bridges in the shape of Roman numerals, sword-shaped blued-steel hands, manual winding calibre 9611 MC movement, alligator strap with 18K white gold double adjustable deployant buckle. Water resistant to 30 meters. Large size (44.4mm x 34.6mm) 18K yellow gold case set with round cut diamonds, silver grained dial with Roman numerals, manual winding calibre 430 MC movement, alligator strap. Water resistant to 30 meters. Large size (44.4mm x 34.6mm) 18K white gold case set with round cut diamonds, silver grained dial with Roman numerals, manual winding calibre 430 MC movement, alligator strap. Water resistant to 30 meters. 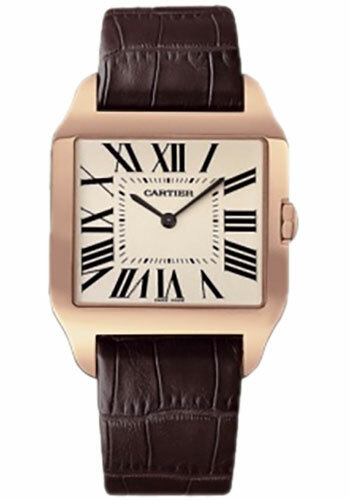 Large size (44.4mm x 34.6mm) 18K pink gold case set with round cut diamonds, silver grained dial with Roman numerals, manual winding calibre 430 MC movement, alligator strap. Water resistant to 30 meters.